In a bid to promote greener and healthier modes of transportation, ofo, the world’s first and largest dock less bicycle-sharing platform operated via mobile app, came together with Saksham Cyclothon, Indore, to help them enter the Guinness Book of World Records for the ‘largest number of bicyclists riding in a city together’. Organised by the Indore Cycling Association (ICA), India’s premier cycling event turned out to be a roaring success with participation from more than 38,000 riders. Witnessed by more than 50,000 people on the ground, the event was attended by the Union Petroleum Minister, Dr. Dharmendra Pradhan. With the common goal to improve the overall quality of lives in India by promoting a greener and healthier Indore through the conservation of fuel, the event gathered massive support from citizens and authorities alike. 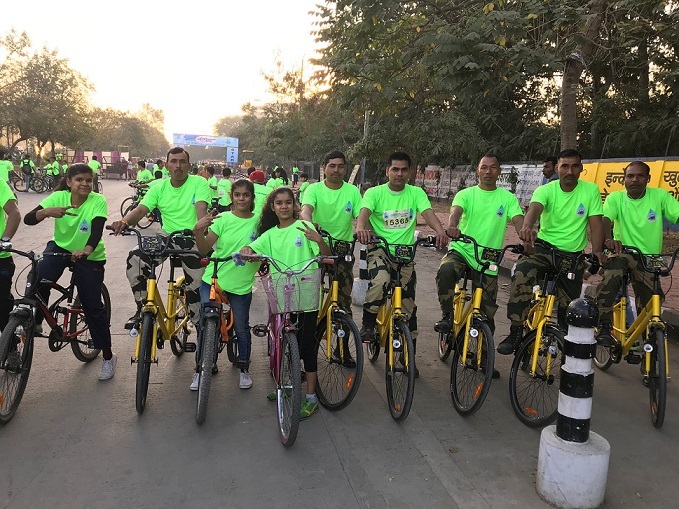 As one of the official partners of the Saksham Cyclothon, ofo provided over 400 bicycles exclusively for the police officials and the Border Security Force (BSF) personnel to help them maintain decorum and security throughout the route. As a part of the event, the BSF jawans exclusively rode ofo bicycles through the 13-km track. Sustaining the mass biking activity and pushing the cyclists towards their collective goal, ofo aided participants with refreshments and assistance by setting up regular ‘pit stops’ along the winding stretch from Vijay Nagar to Dussehra Maidan. Flagging off the event, Shri Dharmendra Pradhan, Hon'ble Minister of Petroleum & Natural Gas, Government of India, asked all present to take an oath with him to conserve fuel and protect the environment. “As responsible citizens, we will all raise awareness about conservation of fossil fuels to ensure a better environment for future generations and to create a new and healthy India,” he said. “This is a proud moment for Indore. The city is at the forefront of what is fast becoming a nation-wide movement for change. ofo has initiated pilot projects in some gated communities here, we look forward to continued support from the city and its amazing bicycling population”, added Ashish Gautam, City Head, Indore, ofo. Present in in over 250 cities across 20 countries, ofo kicked off this year with a series of pilot launches across 7 Indian cities – Indore, Ahmedabad, Bangalore, Delhi, Pune, Coimbatore, and Chennai. The bicycle sharing major has also signed MoUs with the Pune Municipal Corporation (PMC) and Coimbatore City Municipal Corporation (CCMC). Saksham Cyclothon is an initiative by Petroleum Conservation Research Association (PCRA), a non-profit organization setup in 1978 under the aegis of Ministry of Petroleum & Natural Gas, Government of India. It aims to create awareness among the people about the fuel conservation, environment protection and promote use of cycle for short distances, which will not only save fuel but also help in creating greener environment and better health conditions. Founded in 2014, ofo is the world’s first and largest “station-free” bicycle-sharing platform operated via an online mobile application. The development of ofo platform was inspired by the concept of sharing economy and facilitated by smartphone technology, aiming to tackle “the last mile” challenge in urban areas. As of today, ofo is ramping up operations in over 250 cities across 20 countries. It generates 32 million transactions daily and has provided over 200 million global users with 6 billion efficient, convenient and green rides, which have reduced carbon emissions by over 3.24 million tons in total, the equivalent of saving more than 920 million liters of gasoline or reducing 1.55 million tons of PM2.5 emissions. From April to June of 2017 alone, users worldwide accumulated a riding distance of over 1.2 billion kilometers, reducing 84 million liters of fuel consumption and 265,000 tons of carbon dioxide. ofo’s bicycle-sharing system requires no fixed docking stations, providing significant flexibility for users to find and return bicycles. As more people switch to ofo bicycles from cars for short-distance travel, they do only not get more exercise by riding, but also helps reduces traffic congestion, fuel consumption and thus air pollution. In July 2017, ofo has completed Series E funding of US$700 million, becoming the world’s biggest and most valued bicycle-sharing company. The logo ‘ofo’ resembles a person riding a bicycle towards the west, where the two lower-case ‘o’ represent the front and rear end of the bicycle wheel while the ‘f’ denotes the user. Before the time of the invention of ofo, many metropolitan cities have deployed certain extent of bike-sharing schemes, hoping to mitigate the long-lasting challenges of heavy traffic and environment pollutions. However, docking stations occupy pedestrian space and make it inconvenient for people to pick up and return bikes. It is also a lengthy process to get approval, funding and maintenance support from local governments and agencies. ofo is the world’s first company to propose a “station-free” bike-sharing scheme facilitated by its mobile application. This revolutionary model brings true flexibility and convenience to users and ensures that all users have access to ofo bikes anytime anywhere.